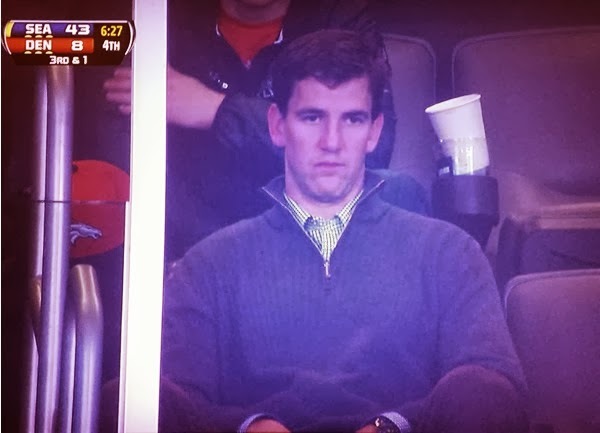 This picture tells a lot more stories than Eli's face. Which is classic. It literally looks like he's about to cry, as he witnesses his big brother get beat up by bullies. There's empty beer cups behind him, reminiscent of a time in the game in which he might have felt like drinking beer. This is not that time of game. And who hasn't been there when you just turn the TV off. Or shoot it with a gun. But he had to keep watching. They guy behind him, arms crossed frustrated, can't even wear his Broncos hat anymore. And just the two of them, nobody else could bear to watch. And of course, the score. Brutal. You could literally sum up the game with that one well-timed TV shot. But we have more space than that. First of all, my gambling picks were completely out of sight. Coming into Super Sunday, I was $4,604 in the hole, or 15% down (given $30K in wagers). But I raised the stakes, baby. Here's the declaration. I put down $5,000 each on the S/U, ATS, and O/U, and won all three for $14,841 in profit. Clearing $10,237 for the entire playoffs with $45,000 wagered. Not bad. I've done worse. Bottle of Champagne on me! Who would YOU think would have won the game. Let alone not been blown out???? Shows what stats mean. Turnovers, special teams scores, and a complete lack of any running game dictated the outcome. Not to mention mental mistakes like the safety to start the game, and the constant pressure on Manning forcing the two turnovers. Three factors I think that were underdiscussed. The Broncos, not being at home, could not utilize their normal array of audibles (yes, including "Omaha") and presumably had to settle for a less effective play. The Seahawks defense is salty. Didn't have to gimmick, just play straight up and they wouldn't get beat. Pete Carroll and his Seahawks coaching staff completely out-prepared John Fox and his Denver Broncos coaching staff. Congrats to the City of Seattle, been decades since a team won something. And they are great fans.